So..... I came up with this idea. Not only is that an excellent idea, but the video is great as well. No fluff and gets straight the point with clear and complete details. Great job! Minus the painting part though, for me at least. I hate painting. I prefer the natural patina of things, but mostly because I hate painting. And drum brakes. I hate those too. Great idea, good job, good work on the video. Probably took more time editing the video than the project but it leaves a step by step tutorial for somebody that wants to build one. No questions asked kind of thing just a 'watch and do'. Hook and ring sizes can be a user choice affair. Now for me, I would dip those forward rings in a plasti-dip or wrap 'em in tape so the fishin line and poles don't rub. Just a preference thing on my part, not a critique. Excellent idea! We're debating between getting a topper or a headache rack for the truck to carry more stuff and haul the kayaks. This definitely gives a good room for the truck. I love the idea of rubber coating those rings. I wonder what the best product would be? Any ideas? 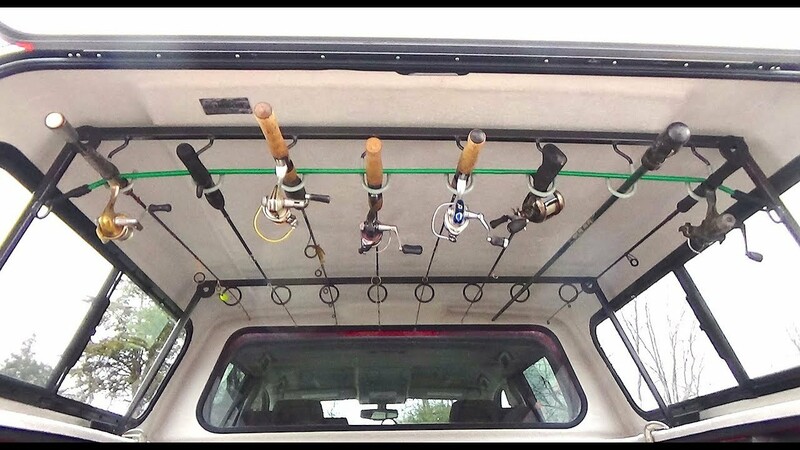 I use to have a canoe rack over my topper years ago. No drilling...... it was just like the thing I made here, except it went on the outside of the topper. Since it's going to be in the weather, I'd make it out of Aluminum, or just buy one. No idea anymore. Years ago there was this product marketed for just that, coating handles and such. I bought one can and it sort of worked as advertized. It was like a tall pint can, dip the handle or whatever in then hang it to dry. It wasn't real user friendly because the level soon receded too low for any thing very long and started to skin over because of a poor reseal container. There has gotta be something better by now. Wonder about that flex seal spray? I wonder if a fella could figure out how to do it with caulk....... I know...... redneck, but .............might be worth the experiment, as well as proving and strengthening my Redneckness. If you can make fancy counter tops out of concrete, then you can make "rubber coating" out of caulk and make it look good! I'm seriously going to experiment with this idea.